Last year I visited Florida and on the top of my list of things to see was Cape Canaveral, because, space and all. As I arrived I was instantly in awe of the sights I saw as it gave weight to the space race that I was not alive to see. The tour is amazing as you are shown everything from the rocket they used to launch the Apollo missions to a working control center that replays the communication between mission control and the astronauts on the night we landed on the moon. I felt as though when I left that I had a better understanding of what we did as human beings and as a country to achieve such a marvel on the grandest of scales. Remembering the sheer enormity of everything I saw, I was curious to how First Man would live up to it, and let me say it didn’t disappoint. The story starts in 1961 as Neil Armstrong (Ryan Gosling) takes a plane into the upper atmosphere as he test man’s ability to handle what is just beyond earth. With Armstrong behind the stick those limits look endless even when the plane malfunctions he still lands it safely on the ground. Like that plane he was flying the space program is moving at a fast speed, as America is playing catch up with Russia and is looking to surpass them. Along the way accidents happen and lives are lost with each one weighing on the people in the program and especially on Armstrong because of his own personal losses. All of this eventually pushes NASA to learn from its mistakes and in 1969 Armstrong leads a crew to make what many thought was impossible, a trip to the surface of the moon. 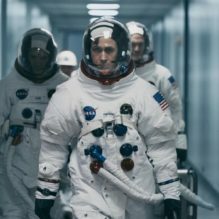 Watching First Man the first thing that came to my mind is, man can Damien Chazelle direct a movie. There is a beauty and near perfection to his filmmaking style that on a technical level is as sound as it comes. From a screenplay by Josh Singer (The Post) and the book by James R. Hansen, Chazelle puts you at ground zero in the space program. There are times that not only are you watching what the astronauts had to go through, Chazelle uses the camera to put you in the middle of it all. The story which takes place over nine years always feels at the right pace and never downplays the moments that are significant to history. Most of those moments are astonishing to behold as Chazelle uses a brilliant combination of silence and a subtle score to emphasize the scope that was witnessed by a select few. With everything in place with the story, Gosling once again delivers and plays Armstrong as a hero, but also as someone who is certain about his humanity. Put everything together and you have a film that gives weight and relevance to something so important, even though for so many they were not there to see it as it happened. For me First Man reminds me when things were simpler and we were still considered explorers. It also reminds me that no matter how many films cover this particular subject, it always seems to land at the perfect time.